Contents: rolls, a slice of pineapple, soup, milk, and noodles. Notes: I like the pink mat under the food. Aren't many Japanese people lactose intolerant? 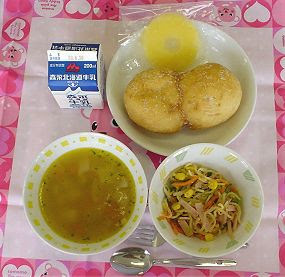 In Japanese schools lunch is served in the classroom by the students. Each student brings their own towel/place mat/handkerchiefs to put on their desk to eat their lunch on. You guys are missing the point. The lunch looks way more healthier than what you get here. Accept it guys! Are Japanese people lactose intolerant? That would be so ironic considering their milk, general dairy products, cakes, coffees, chocolate etc consists of so much more real milk than other Asian countries' or America's (where the milk is watered down to fill the gallon containers). These are school lunch for younger kids. Lactose intolerance can be developed later in life stage when milk is no longer the only source of food, just like many other animals in nature. So when we are younger, very few humans are lactose intolerant. After growing up or getting older, 70% of Asian (more women than men) gradually develop lactose intolerance naturally. A lot less European descendants developed it. Maybe it is due to the agriculture conditions in Europe that requires adults to consume milk as a food supplement in the past 1 thousand year, while in Asia, food other than milk are abundant and no need to consume milk any more. Sorry, by Asians, I meant East Asians, who grow up in area where tofu, spinach, collard greens and fish are major food source. So no calcium shortage without milk.